Mark Thompson, right, shows members of the Weslaco police and fire department how to use an automatic defibrillator during a training session Monday Sept. 18, 2017 at the Knapp Conference Center in Weslaco. Several of Weslaco Police Departments' vehicles will have defibrillators inside them in case of emergency. 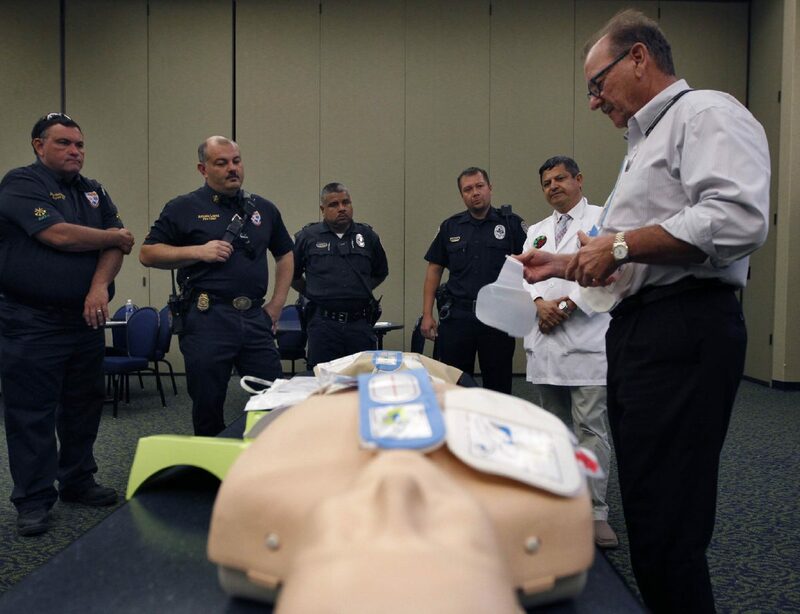 WESLACO — It was during a lecture on early defibrillation that Dr. Robert Sepulveda had an epiphany: Why aren’t police officers equipped with this life-saving resource if they’re often the first on the scene of an emergency? The internal medicine physician at Knapp Medical Center decided to do something about it, considering that the two or three minutes it takes for fire and EMS to respond to a heart attack call can be a matter of life or death. Starting next week, patrol officers in Welsaco will carry defibrillators, making them one of the first police departments in the Rio Grande Valley to have this equipment in their vehicles. Defibrillators are handheld devices that shock the heart to reset an irregular heartbeat; they are used in conjunction with CPR to revive someone who’s had a heart attack. The chance that someone will survive drops by 10 percent each minute defibrillation is delayed, Sepulveda said. It’s for this reason that defibrillators have become increasingly common in government buildings, airports and schools. Officer Eric Hernandez said the department plans to have as many as three patrol officers equipped with defibrillators per shift “in case an emergency arises.” He said some days police respond to as many as three heart attack calls, and other times they can go a couple weeks between calls. Officers received training on how to use the defibrillators on Monday by Knapp Medical Center staff and the Weslaco Fire and EMS Department. Fire Chief Antonio Lopez said his department is in daily communication with police. The Knapp Volunteer Auxiliary raised $15,000 to purchase and donate 12 defibrillators to the Weslaco Police Department. It’s the first time the group of 77 volunteers has made a donation outside the hospital community, said Imelda Ambriz, volunteer services manager.